After a few attempts at the NetExtender install it completed successfully after I installed *all* the drivers for the Folio13 from the HP site. That got me excited and I thought I was all set, I tested the SSLVPN client and it authenticated and connected and looked like it was working. It wasn’t until later that evening when I went to use the VPN that I realised it wasn’t working at all, and even though the connection looked fine there was no network traffic being received by the VPN client. Funnily enough, you don’t seem to need the route delete commands in the NxDisconnect.bat? Next time you network boot a device, press F8 at the PXE menu to see all the menu items and ShadowProtect will be there! Our staff trainer presented this to the teachers last night and with 460 student netbooks on campus, with another 320 coming in December, should get a bit of use. We extracted the files from ICSetup.exe and used Altiris to push the InteractiveClassroom_O14.en-US_x86.MSI silently to our staff tablets and student netbooks. PowerPoint and OneNote gain an Academic menu which in PowerPoint is used to start a shared preso, and in OneNote is used to connect to the preso. 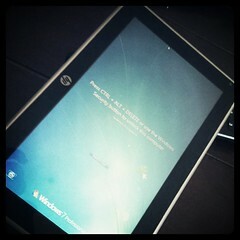 This week we’ve had a HP Slate 500 to try out and see how we like it for Staff and Students. Since the release of the iPad we’ve been under pressure from all and sundry to purchase some and put them around the school, especially in the junior years. The iPad’s consumer focus makes it a nightmare on the network, and the concessions that a systems administrator has to make between device permissions, network authentication, wireless security makes them a high maintenance device. We’ve been looking forward to the Slate 500 for some time, knowing that Windows 7 Pro will work perfectly on the network, and hoping that it will be an equivalent device to the iPad, and what it may lack in style, is certainly made up for in substance. While I’ve been happy with the Slate 500 there have been a few disappointments. Only having one USB port on the device is limiting. There’s been a few time already where I’ve wanted to attach combinations of an external keyboard, mouse, memory stick and ipod, and have had to find the dock which has another two USB ports. Adding one more USB port to the device would make a huge difference. The onscreen keyboard in Windows 7 could be better too. Having an option to remove the row of numbers and punctuation keys to make it similar to the iOS keyboard would allow for the keys to be larger and the keyboard to occupy less real estate on the screen. The onscreen keyboard can be resized but when reduced to a reasonable size the keys are unfit for the ham fisted. It’s also disappointing that software on Windows 7 isn’t touch friendly. If I had a Slate 500 I’d hit IE9 and a PDF reader fairly hard and so far, it’s been a mediocre experience. The advantage that iOS apps relying on touch makes them typically touch friendly. The only exception being a horse racing app that I had for about 5 minutes that looked like it was made for Windows 3.1, which was fairly amazing. It’s probably safe to assume that as more Windows based tablets appear the OS and software will gradually catch up and become touch and gesture friendly…. Anticipating a purchase of Slate 500 devices, we would want to image and control the devices through Altiris. Neither the device nor dock are equipped with an ethernet port, however, the HP USB Ethernet Adapter may PXE boot for Altiris according to Rick on the tabletpcreview.com forums. The Slate 500 is essentially the same performance wise as the 5101/5103 netbooks that we’ve been using for the students, with a slight smaller LCD and screen resolution. The battery life supposedly is up to 5hrs, but I haven’t had the chance to confirm. It seems that we’ll certainly get a handful and put them in the hands of teachers, students and executive staff to see how they compare to our fleet of netbooks and tablets, and whether they are a worthy replacement, or an additional tool. I’d like to see an app for Windows Slate machines where the slate can act as a second screen for a PC/notebook. Then when I’m working on my tablet, I can find the information on the web that I need, flick that browser window to the slate. Then I can read instructions and work on my tablet without having to Alt-tab. That would be superb. This week we’ve been rolling out more Mitel VOIP handsets and had to make sure we had the Voice VLAN pushed out to all the switches and check the tagging on the uplinks to make sure the handsets would all connect properly. After an hour of chasing VLAN tagging via the CLI I thought I’d better see if there was a smarter way to check the switches and fired up ProCurve Manager Plus. Under Default Management Group –> Network Map –> VLANS you can select the VLAN number that you want to check and PCM will show a network map with the switches that have that VLAN tagged and show you how those switches are connected to each other. Or more importantly, not connected. name "10Gb Uplink from Core"
We’ve been using NPS on Server 2008 for a while now and its been perfect for handling 802.1x authentication (EAPTLS) and radius auth from the HP WESM in the 5400zl. The radius setup for the HP Wireless Edge Services was pretty easy, it only needs radius clients for the Primary WESM and any Redundant WESM’s. Now that we’re adding another 50-70 E-MSM422 AP’s for the MSM765 controller we need to add radius clients for each AP. After a conversation with Adam (@DJADSA) we worked out that we were going to hit the 50 radius client limit in Server 2008 Standard. Adam showed me a couple of neat tricks with their NPS configuration that would save us a tonne of time and are new additions to R2! The first trick was adding a subnet range for Radius Clients instead of adding a radius client for AP individually. Adding the IP/CIDR and shared secret will let all devices in the range talk to the NPS server. With SQL logging enabled it give us the option of writing a web part or two for SharePoint to let staff know which users are connected where, and lets us easily run scripts to find client/authentication problems. This week we’ve been reconfiguring our MSM765 wireless controller and adding some new features for Students and guests to the School. With our old ZL WESM we were able to have a VLAN on the wireless network with an HTML based login, which allowed the students to use their own machines on the wireless network with their AD credentials. We wanted to replicate this setup on the MSM by using HTML-based user logins and still use their AD logins. We hit a problem when we tried to configure the Active Directory Authentication on the controller because the time on the controller wasn’t in sync with the 5400 chassis or the domain! We’ve just updated the firmware on our NSA 4500 to 5.5.2.0-3o and have started playing with the Application Firewall and DPISSL (Deep Packet Inspection). The 4500 is a Layer 7 firewall and the application firewall feature lets you do some pretty tricky filtering. We’ve noticed that some of the student machines coming in for repair have bittorrent clients installed. At the moment that sort of traffic is blocked by our ISA firewall/proxy which is the gateway for the Student Netbook VLAN, but we want to remove that over the next few months because it causes a bottleneck for heavy traffic, like heavy ClickView use. When we remove ISA we can either use the Sonicwall or ACL rules on the ProCurve 5400 (or both) to filter the traffic between the netbooks and the rest of the world. After the firmware update with the addition of the DPISSL it seemed like a good chance to see how good the filtering was on the NSA4500. The combination of the application firewall and the DPISSL would also prevent this traffic from running over secure ports or ssl vpn type setups. Since we imaged our 2740p Tablets with our Windows 7 SOE two weeks ago, we’ve had a few problems with machines blue screening on shutdown and hadn’t been able to work out which application or driver was causing it. When a machine BSOD’s it creates a minidump file with debugging information about why Windows crashed. Usually we can work out what’s caused the BSOD and we can fix it without having to check the minidump, but this one had us stumped. Downloading Windows Debugging Tools and the Windows SDK sounded like a massive effort for checking the contents of a file, but in the end, it turned out to be nice and easy. PCHell has a nice Step-by-Step guide to viewing minidump files and after downloading and installing the debugging tools, all we had to do was run WinDbg and open the last minidump file to see that NIPALK.SYS was the offender. WinDbg doesn’t make you trawl through useless info to get to the offending driver, the info you need is at the bottom of the dmp file labelled Probably Caused by!